He’s the type of journalist who asks tough questions to your face. “Why can’t we take out these bastards?” he once asked President Barack Obama, referring to the terrorist group ISIS. Jim Acosta isn’t one to be intimidated. The CNN correspondent believes that a journalist’s job is to challenge those in power. He discussed some of these moments on stage during the Excellence in Journalism convention in Anaheim this week with other White House correspondents. Acosta was in town to be accept the Presidential Award award from the National Association of Hispanic Journalist during its closing gala. “Jim has been sort of representing the White House press corps in a lot of public moments where he has sparred with the president and the administration,” Buzzfeed White House correspondent Adrian Carrasquillo said. Nine months ago, he clashed with then President-elect Donald Trump. “You’re fake news,” Trump told Acosta, who waved off the comment. Acosta urged journalists to hold their ground at Saturday’s panel and said now is a gratifying time to be a journalist. “They can’t handle the truth and they can’t take the heat,” Acosta said, eliciting applause from the audience. Acosta’s career began in the nation’s capitol where he grew up with the Washington Post on his doorstep and politics in his blood. He’s the son of Cuban immigrants who escaped the Castro regime in the early 60s. His love for journalism started at an early age during a field trip where he witnessed the return of U.S. diplomats who were held hostage in the embassy in Tehran. 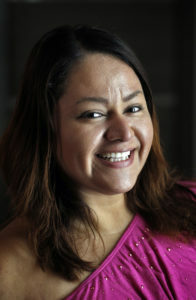 Romyna Camacho’s passion is producing. A broadcast and digital journalism major at California State University’s campus in Fullerton, Camacho thought she wanted to be a reporter early in her college career. But once she got involved with the communications program on campus, she realized she loved producing because whether it’s a failure or a success, she knows it’s work she can claim as her own. At Telemundo 52 in Los Angeles, Camacho helped write scripts and edit footage as an intern. Her dream is to produce internationally for CNN or Fusion and eventually cover environmental issues such as drilling and pollution in Latin America.